This is a joint workshop for WRF (Weather Research and Forecasting Model) and MPAS-A. (The Model for Prediction Across Scales - Atmosphere). The MPAS-A model is a global nonhydrostatic atmospheric model that has been developed for weather, climate, and regional climate applications. Its horizontal mesh is based on an unstructured spherical centroidal Voronoi tesselation (nominally hexagons) with C-grid staggering that permit both quasi-uniform and variable-resolution configurations. MPAS-A numerics are essentially those used in WRF-ARW adapted to the Voronoi mesh, and the model uses a subset of WRF physics. 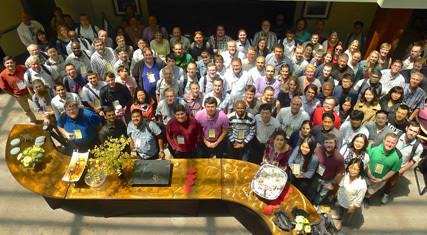 The workshop will take place on 10-14 June, 2019 at NCAR's Center Green Campus in Boulder, Colorado. The primary objectives for the Users' Workshop are to provide updates for WRF and MPAS modeling systems, to discuss model development and issues, and to present evaluations and applications of the two models. Papers focusing on development and testing of model applications in all areas are encouraged. This year we especially seek contributions on using visualization and diagnosis tools (such as NCL, RIP, VAPOR, IDL, WRF-Python, Python, GrADS and others) to analyze atmospheric simulations. Authors may request either a poster or an oral presentation; however, we encourage authors to consider submissions for a poster presentation, due to time constraints for oral sessions. To submit an abstract please go to the registration page. In this series of talks, we will highlight a few visualization and analysis tools commonly used in the WRF and MPAS communities. Introductions, examples, and resources for these tools will be provided. VAPOR is an application developed by NCAR for 3D scientific data visualization. It is free to use, open source, and runs on OSX, Windows, and Linux.In this session, users will be given an interactive tutorial on how to use VAPOR to produce 3D images and movies from WRF data. VAPOR contains a set of renderers that can be used to demonstrate various weather features. This tutorial will interactively demonstrate to users how these renderers can be used to visually explore the regions and features of interest within model data, and how to depict these regions in an aesthetically pleasing and scientifically publishable way. This mini-tutorial is geared towards WRF users who would like a look at ways in which the NCAR team has been using cloud platforms for WRF. The course will cover the basics of cloud computing, and various ways in which this can be advantageous to WRF developers and users. We will cover accessibility, manufacturing clusters, viewing images, building and running the WRF system code, testing methods, archiving data, and sharing pre-configured environments. We will take you on a jargon- and acronym-filled whirlwind tour of cloud computing, with a special emphasis on the WRF system. All you need to bring is your laptop (that runs a UNIX-like OS – e.g., Linux, Mac, or Windows with dual-booting into a Linux platform). Amazon Web Services (AWS) is supplying the computational credits for our practice, and NCAR is supplying the guest logins. Some significant problems HPC users face with cloud computing are how to correctly and efficiently configure multiple compute nodes, how to perform visualization in a collaborative environment without massive data transfer, and to how to maximize cost efficiency. Scala Computing offers an easy and cost-efficient way to run the WRF model across large core counts all with a single click, a parallel file system for trouble-free data management and a straightforward way to use your favorite graphics package entirely in a cloud environment. In this session you will learn best practices for cloud HPC to maximize productivity and performance gain and minimize cost when adopting the cloud. In addition, this session will provide you with a demonstration on the ease-of-use of running an end-to-end WRF job along with insight into the Scala Compute Platform feature-set. Please click here or go to the registration page to register for the workshop and submit papers. Early registration fee is $200.00 ($210 if planning to attend the Friday session). The late registration fee is $250.00 ($260, if attending the Friday session). During the workshop, the WRF helpdesk will be open for several sessions for users to discuss their special issues with developers. Abstract submission deadline is 22 April. Early registration ends: 20 May. Late registration begins: 21 May. If you cancel your registration prior to 20 May, we will refund your registration minus $25 to cover administrative costs. After 21 May, no refund will be given for cancellations. * Please note: any abstract changes made beginning 22 April will be made online but not in the printed agenda and any abstracts submitted or changed after 20 May should be emailed to "wrfhelp at ucar dot edu". Workshop presentations and extended abstracts will be published on our website via links provided during the workshop. (You may indicate that you do NOT want us to publish your abstract when you submit it). Extended abstracts in PDF format can be submitted via the registration page, and will appear on the web before the workshop. We would like to encourage all poster presenters to provide us with an electronic (preferably .pdf format) version of their posters (or a short .pdf file describing the poster) so that we can post it on our website prior to the workshop. Please email these to "wrfhelp at ucar dot edu". If presenters are not able to submit them to us before the workshop, we will still be accepting them afterward, and we will post them upon receipt. Blocks of hotel rooms have been reserved at three different Boulder hotels. Please click on the "Lodging" Tab at the top of our website for details.